A Toronto epidemiologist hired by the National Hockey League has told a U.S. judge overseeing the NHL concussion lawsuit that it’s impossible to prove a link between hockey and chronic traumatic encephalopathy, or CTE, because some people who haven’t played contact sports have wound up suffering from the brain-withering disease. In court documents filed on Wednesday in Minnesota, Dr. David Cassidy, a professor of epidemiology at the University of Toronto’s Dalla Lana School of Public Health, wrote that U.S. District Court judge Susan Nelson should exclude the testimony of Dr. Robert Cantu from the high-stakes concussion case. Dr. Cantu is a Boston neurologist who has studied head trauma in athletes since at least the mid-1980s, and has acted as an unpaid advisor to the NFL. His testimony is likely to be an important factor if the 150-plus retired NHL players are to win at trial in Minnesota. 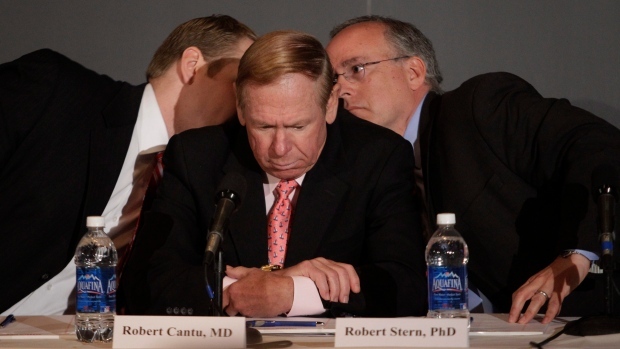 The co-founder and medical director of the Concussion Legacy Foundation in Boston, Dr. Cantu has been hired as an expert witness by lawyers for the former players. He has testified that playing hockey in the NHL has placed players at an increased risk of CTE and other long-term neurological disorders. Of eight individuals who had CTE in a 2016 study quoted by Dr. Cassidy, only four had a history of participation in sports (three in football and one in basketball). Another study in 2015 looked at 32 individuals with CTE. "Only 34 per cent had known participation in sports and only 18.8 per cent were military veterans, showing that a sizeable percentage of the individuals with CTE neuropathology did not have documented repetitive head trauma," Dr. Cassidy wrote. Lawyers for the former players on Thursday filed a motion to exclude Dr. Cassidy’s testimony because the NHL had allegedly breached a court order by exceeding a court-imposed word count on filed documents.